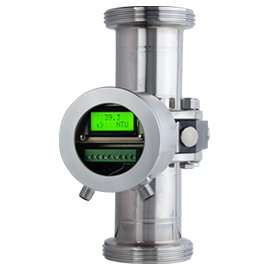 The turbidity meter type “ITM-51” monitors the turbidity of the wort in the lauter tun collecting main (see fig.) 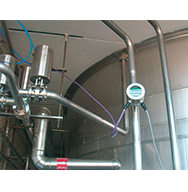 during the entire process and controls the changeover valve for the loop or wort kettle. To start purifying, the wort is first pumped in the loop until the target turbidity value is reached. Only now is the wort sufficiently clear and is forwarded to the wort kettle. If the target value exceeds a defined threshold in the following process, e.g. slicing or sparging, an automatic switch to the loop takes place. A malfunction message is generated if the turbidity value does not fall to below the target value within a defined time limit. If the brewhouse is not occupied then a message is sent to the on-call mobile and the master brewer can access the process externally through his laptop. 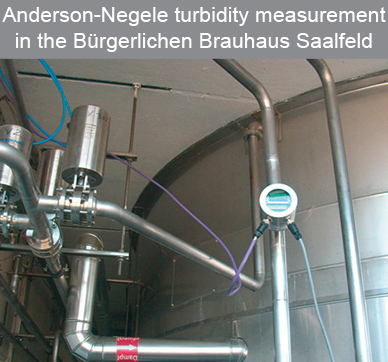 Anderson-Negele turbidity meters are proven and reliable and are used for the continuous monitoring and control of many processes in drink production. 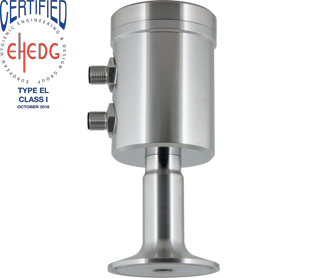 The wear-free LED technology and the materials used (sapphire glass optics) make Anderson-Negele turbidity meters both maintenance friendly as well as impervious to drift and build-up and guarantee reliable operation, even after many CIP/SIP cycles. Expensive lamp replacements that are popular in other procedures now belong to the past.The typically straightforward Anderson-Negele service, the few necessary parameters and the compact execution define the ITM-51 and ITM-4 meters with high practical use and guarantee fast start-up and simple maintenance.